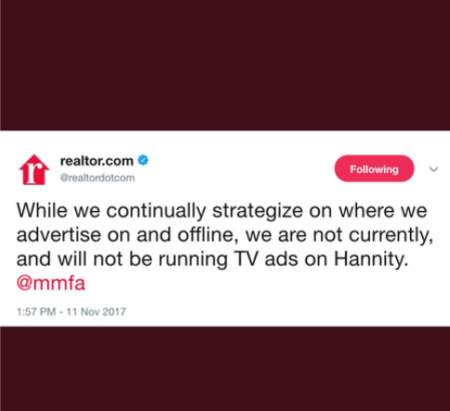 Realtor.com, the real estate listing website owned by media giant News Corp., abruptly reversed course following a vow on Twitter Saturday to cease advertising on Sean Hannity’s Fox News channel show after the host defended embattled Alabama Senate candidate Roy Moore. News Corp. previously owned Fox News, but divested of it as part of a corporate split in 2013 (it’s now owned by 21st Century Fox). Screenshot of realtor.com’s tweet posted on Saturday and later removed. A campaign by Media Matters following Hannity’s plea to viewers not to rush to judgement against Moore, accused of engaging in sexual activities with a 14-year-old girl, culminated with several companies vowing to pull advertising on the show, including Keurig and realtor.com. In a tweet Saturday, realtor.com unequivocally assured its 212,000 Twitter followers that the company would not advertise with the opinion news show, which runs weekday evenings and draws approximately 3.2 million daily viewers to Fox, more than its rivals on CNN and MSNBC. “While we continually strategize on where we advertise on and offline we are not currently, and will not be running TV ads on Hannity,” the company tweeted Saturday afternoon. But by the following evening, the tweet had been deleted after racking up thousands of responses, and a company spokesperson later directed reporters to the company’s advertising policy, which states that realtor.com has a practice of not engaging in boycotts. The advertising boycott stemmed from statements made by Hannity on his Thursday afternoon radio program in which he appeared to suggest Moore’s relationship with the 14-year-old girl was “consensual.” He clarified later that evening on his Fox show that he was referring to past relationships between Moore and two older teenagers, aged 17 and 18, while in his 30s. The age of consent in Alabama is 16. The online response to the boycott was swift, with supporters and critics of the Media Matters campaign weighing in on Twitter and elsewhere. Keurig in particular was singled out by many conservatives and Hannity viewers, who posted videos of themselves smashing their own Keurig-brand coffee machines in disgust. Hannity himself also called out Keurig on his show. Beside Keurig, E*Trade, Nature’s Bounty, 23andme and Green Mountain Coffee all vowed to pull advertising on Hannity’s show. None beside realtor.com have reversed course publicly. News Corp., which owns and operates realtor.com through its subsidiary, Move Inc., reported $2.06 billion in revenue for the first quarter of fiscal year 2018, up from $1.97 billion the year prior, according to CEO Robert Thomson in a quarterly earnings call on Thursday. 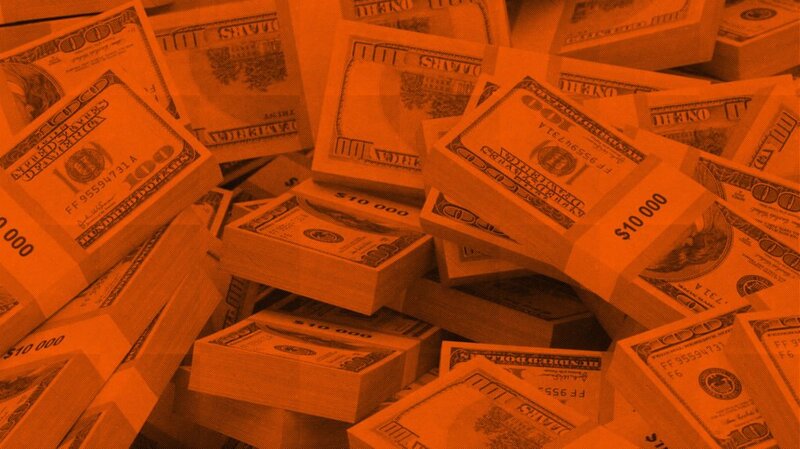 The digital real estate services segment of the business was “once again” the biggest contributor to the mass media company’s profitability, according to Thomson. “In the first quarter, revenues and Segment EBITDA increased across every segment of our business, in particular, in digital real estate services, which have become core to our character and are on track for significant growth in coming quarters,” said Thomson during the call. Digital real estate revenue increased $25 million (13 percent) compared to the third quarter of 2016. Move’s year-over-year revenue growth experienced a 15 percentage point increase to $100 million, from $87 million in 2016. Realtor.com “achieved record traffic in the quarter with 55 million average monthly unique users,” the company said.